Tell us a story about a conversation you’ve had that carried heart and meaning for you. What conversation do you need to have, and what do you now know needs to be in place for that conversation to happen in a good way? Confidentiality prevents me from writing the details here, but I can say how moved I was by people’s stories. I was in awe of the depth and bone-true honesty that emerged so quickly. The power of a simple structure into which much can flow is amazing! AGREEMENTS: a group’s guidelines for self-governance that allow people to be with one another in ways that contribute to the circle’s well-being. CENTRE: the visual and energetic hub of the circle that acts as neutral space, a symbolic representation of the group’s intent, and the Other that is more than the sum of who’s present. After everyone left, I drew a tarot card to respond to the question, “What gifts did we receive in today’s Introduction to Circle Process?” It was the Emperor, reversed. This told me that the gifts we received were self-empowerment, a connection to power-within, a subtle yet powerful infrastructure, and a personal sense of what leadership can be. For these gifts and more, I’m grateful to the archetype of Circle. There’s a circle I’m a part of that has been gathering for almost six years. A few of us had a pot-luck meal and council on Saturday evening. Jerry, one of our members, noticed that it was approaching Earth Hour. He unplugged a couple of household items and turned off the lights. We continued our council of sharing nightdreams, stories, and insights in their large, dark main room lit only by a single beeswax candle. The dancing shadows and campfire-like atmosphere were primal and took us deeper into ourselves and into the experience of one another. If you’re exploring some form of symbolic process or tool — tarot, dream, astrology, soul card, etc. — and feeling a bit stale about what to say, think, or write about it, try using simple poetic structures and/or free-form writing to dig into something different. For example, my Card of the Day today is the Lovers from the Motherpeace tarot deck. From these, I learn more about the card and about what’s important to me at this time. I think of last night’s EarthSong Mysteries circle in which we envisioned together more possibilities about what we can offer to the people who come to us. In recent conversations with my boyfriend, we’ve wondered aloud what might be over the horizon of the next couple of years for us as an “us”. My recent blog entry on creating our own reasons for an event is certainly an example of presence to possibilities and choosing accordingly. And witnessing expressions of love leading to more love is reflected in these poetic little card scribbles. Please try this activity on your own. Pick a card (or dream symbol or whatever) and a simple poetic form such as haiku or cinquain. Jot down some words. Spend a few minutes with what you’ve written. Notice what carries heart and meaning for you as you read your poetic phrases and revisit the picture. What do you learn? As we approach the Vernal (Spring) Equinox, our thoughts turn to new life, a balance of equal night and day, and growth. Where I live, tiny buds are appearing on trees, the whir of red-winged blackbirds is carried on the earth-scented air, and bits of green are just beginning to sprout in the front garden. A. Gather in a circle, whether around a table, on the floor, or wherever. Remove any card(s) from your tarot deck that reminds you Spring and place it in the centre of the playing surface beside some Spring flowers/plants and a beeswax candle. Some examples of appropriate central tarot cards include: Emperor (for Aries), Justice (balance; equal light and dark), Judgement/Awakening (new life; resurrection), or the Ace of Swords/Air (beginning of the season of air). Light the candle. B. One at a time, each person receives the tarot deck as it’s passed clockwise. Each person, when s/he receives the pack, says one word or one phrase that lets the group know how s/he is as s/he enters this game(e.g. “I’m feeling grateful for X this evening.” or “Tired, but happy to be with you all today.” or “Curious about what we’re about to do.”). Then s/he mixes the deck and picks three cards at random before passing the pack to the person on hir left. This continues until everyone has checked in and has three cards in their hands. C. Three rounds are played clockwise (each round’s topic is below). During each, every player gets a turn to lay a card on the surface in front of hir and use its image to inspire a continuation of the open sentence provided. This is done one at a time. Each player can expand on the sentence as much as s/he chooses. they’ve heard or said during the game, mix their three cards back into the pack, and pass it to the person on their right. F. After everyone’s cards have been returned to the deck, the central card is shuffled back into the pack and the candle is extinguished. If flowers have adorned the centre, a lovely gesture is to distribute them to the players to take home with them. 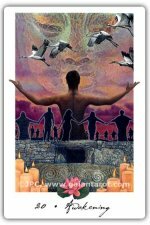 * Image: Awakening from the Gaian Tarot by Joanna Powell Colbert. Lately, I have a problem with the phrase, “Things happen for a reason.” It smacks of being at the mercy of an external agency and doesn’t ring with the choice-centred worldview that I prefer. For me, things just happen. Our own imagination and creativity give an event meaning or a reason. Then we make choices about potential responses to the event. Through the experience we become our own teachers, gathering wisdom that’s relevant and personal rather than accepting a pre-fabricated belief or practice. Last week, my brother-in-law Alex died unexpectedly, leaving my sister widowed and my niece fatherless. The funeral was yesterday. Sad? Yes. Numbing? Yes. A blow to the heart? Yes. Yet, I have a choice here. Will I become hardened and cynical about life or will I allow this breaking open of the heart to remind me of my connection with loved ones? I choose the latter. There were people at the funeral with whom I wish to remain in better contact. I witnessed people there who for whatever reason hadn’t been communicating with one another reach out, hug, cry, and really be there for and with each other. Will I allow my spirit to wither or will I allow it to touch others? I choose the latter. The meaning and reason that my imagination and creativity choose to weave from the event of Alex’s death is to stay connected. In our connection, healing can take place within me, within our family, within our community, and (one hopes) within our world. What major event has occurred in your life? How did you choose to respond to it? What did your choice(s) teach you? How is that teaching a gift to our world? * Image: Wheel of Fortune from “Tarot ReVisioned” by Leigh J. McCloskey. While journalling last night, I had a realisation that our ultimate goal in using circle process is to become the Centre — an embodiment of neutral acceptance, greater intent, and a hub that holds things together. When we say that our ultimate reliance in a circle-based group is on Wholeness or Centre or Something Greater than ourselves, I now feel that we’re relying on our Best Selves, the Centre/Wholeness that we truly are. The above photo shows me lighting a candle in our centre at a circle practicum in 2008. Now I have a sense that I was/am doing my best (with varying degrees of success) to remember the welcoming hearth within myself. I really feel at home in groups that are planted in circle process — attentive listening, intentional speaking/expression, and contributing to the well-being of the whole. This morning, I counted eight circle-based groups of which I’m a member. Some people are common to two or three of them. Other people are only in one type of gathering. All of them nourish me and allow me to share my gifts and talents in some way. Two groups are shamanic, one of them focused on a specific way of healing. Two are devoted to practising how to be in the world in ways that are wholeness-remembering and conducive to peace. One is a mastermind circle in which a few of us self-employed guides and creatives support one another’s work. My monthly tarot gathering is a great outlet for ideas that come to me and is one of my means of income. Another gathering is connected with a retreat and teaching centre in a nearby town and consists of a few people who are agents of creativity and helpful change who wish to weave our ways into the community. The final regular circle is one that’s online and over the ‘phone and connected with a specific tarot deck. In all of these groups, I experience respect, wisdom, humility, and camaraderie. The gatherings sustain me just as much as food and water do. Do YOU long for a connection with a circle of folks who really get you? On Saturday, March 26, from 1:00 to 4:00 p.m., I’ll offer an Introduction to Circle Process in my space in Toronto. You’ll get the chance to experience a simple council circle, talk about it with one another, and receive some advice and helpful handouts. All for only $50 (pre-paid). Please join us. Call me at (416) 966 – 2685 for details.